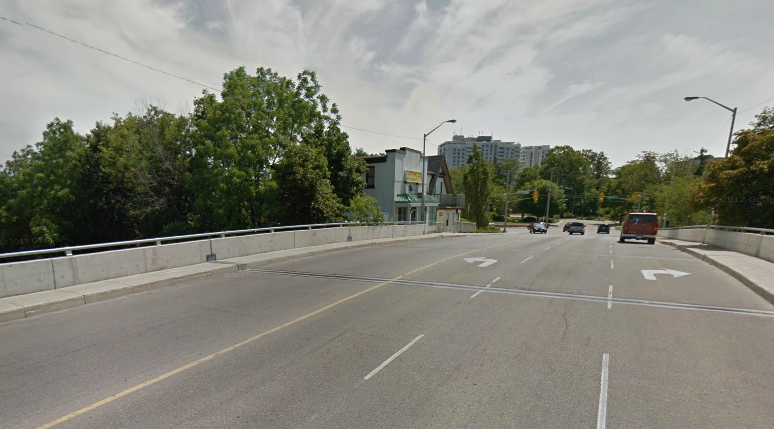 From Kitchener City Hall – The city has just received the peer review report of the detailed structural evaluation of the Margaret Avenue Bridge. The city closed the bridge on June 13 based on recommendations in a preliminary report from a local consulting firm hired to inspect the bridge. The purpose of the peer review was to verify the assessment and recommendations made by the first consultant including the recommendation to close the bridge to all traffic. The peer review report supports the original findings, and states that closing the bridge to traffic has substantially reduced the risk of sudden failure of the bridge. The structural engineer’s report does not believe shutting down or restricting railway services below the bridge is warranted at this time. The peer review report has also been sent to the railways. Consultants are now working on a feasibility study to determine if the bridge can be repaired or if replacement of the bridge is required. This feasibility study is expected in mid-August. The bridge will remain closed until a decision is made based on the results of the feasibility study. Qualified inspectors continue to inspect the bridge three times a week in the interim. Additionally, your Blog crew were listening to the local CBC station this morning and Barbara Robinson was quoted. She is the Director of Engineering for the City of Kitchener and believes the feasibility study will likely conclude the bridge will have to be torn down and rebuilt for a cost of around 5 million dollars.